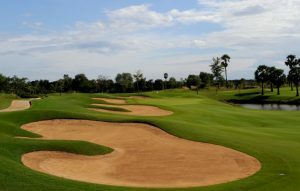 Siem Reap (Cambodia) – April 11, 2019 (travelindex.com) – Cambodia is poised to become a genuine twin-centre golf destination as a result of two announcements made during the 8th annual Asia Golf Tourism Convention. The event, held by the global golf tourism organization IAGTO in Siem Reap, the gateway city to Cambodia’s ancient Angkor temples, was attended by 420 IAGTO member delegates from 45 countries. IAGTO Chief Executive Peter Walton said: “It was very special to be able to stage this year’s event just a few kilometres from the number one-ranked UNESCO World Heritage Site of Angkor Wat and this was not lost on our members, most of whom were visiting Cambodia for the first time. AGTC 2019 took place at the Sokha Siem Reap Resort & Convention Centre, located 6km from Angkor Wat and only a 15-minute ride by tuk tuk to the bustling heart of Siem Reap. Cambodia offers incredible value for money, a laid-back attitude, convenience, comfort, tranquillity and nightlife along with a variety of great golf experiences, said Peter Walton. AGTC is an annual meeting place for IAGTO members, focused on golf tourism development within the Asia, Pacific, Indian Ocean and Gulf States regions. 420 IAGTO members participated from 45 countries including 162 golf tour operators from 34 countries. Golf destinations represented included Cambodia and the ASEAN countries of Brunei, Indonesia, Malaysia, Myanmar, Philippines, Singapore, Thailand & Vietnam; China & Japan; India & Sri Lanka; Mauritius; Australia & New Zealand; Abu Dhabi, Dubai & Oman; Russia, Azerbaijan & Turkey. AGTC 2020 will take place in the week beginning Sunday 29 March at a venue to be announced later this year. Copyright © 2019 Visit Macao. All rights reserved. Powered by Travelindex.